The delicious flavors of chocolate and coffee combine to create mocha brownies that are simply marvelous! Coffee has a wonderful affect on chocolate; making it more interesting and intense. This Chocolate Brownies Recipe combines the flavors of chocolate and coffee into rich, dense, fudgy mocha-flavored brownies that are hard to beat. If you love the way chocolate and coffee work together to create mocha, you will want to give these chocolate brownies a try. This chocolate brownies recipe is easy to make too - all these mocha-flavored brownie ingredients are combined in one pan! So if you need to make a batch of brownies in a hurry this is the Chocolate Mocha Brownies recipe for you. Once you decide to give these brownies a go, take a few minutes to gather your ingredients and tools and make sure you have everything you need before beginning. This makes baking that much more fun and easy. Grease an 8-inch square baking pan and set aside. Alternatively, line the pan with greased parchment or foil. Melt butter in a medium saucepan over low heat. Stir in the cocoa and coffee until just combined. Remove from the heat and stir in the sugar, eggs (one at a time), and vanilla until the mixture is smooth and glossy. Stir in the flour and chocolate chunks until just combined. Spread the brownie batter evenly in the prepared baking pan. 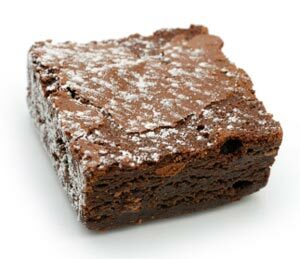 Bake for 25 to 30 minutes or until a wooden toothpick inserted into the center comes out with small clumps of brownie sticking to it. Don't overbake or your brownies won't be fudgy! Cool the pan of brownies on a wire rack and then cut them into desired size and shape. Try cutting your brownies into triangles for a unique change of pace! Dust lightly with powdered sugar if desired. This recipe makes one 8-inch pan of Mocha Brownies. Looking for a slightly different twist on your chocolate brownies recipe? Combine butter and unsweetened chocolate in a 2-quart or 3-quart pan over low heat, stirring frequently until melted and smooth. Remove pan from heat and stir in sugar, eggs, vanilla, flour and ground coffee beans until well blended. Place 48 small foil baking cups (about 1-inch in diameter and will fit snugly) in a 13x9-inch baking pan. 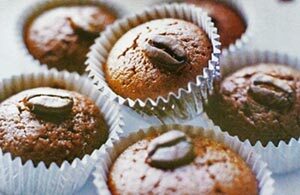 Fill cups equally and evenly with brownie batter and top each one with a while coffee bean. Bake for 18 to 20 minutes or until centers of brownie cups spring back slightly when pressed. Cool the cups in the pan on a wire rack. This recipe makes 48 Mocha Brownie Bites.